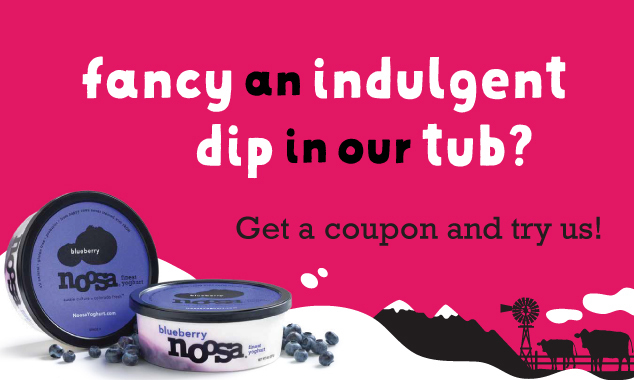 This blog post is sponsored by noosa® yoghurt and SocialMoms. As always, the opinions and ideas expressed here are my own, and also really yummy. I’ve been making an effort to eat breakfast every morning, and in order to get myself pumped for a meal I usually skip, I’ve had to get creative. Here are three of my favorite breakfast recipes unlike any other that I make to accompany my yoghurt these days (adding yoghurt to my diet has been so helpful for my IBS symptoms, I can’t recommend it enough). 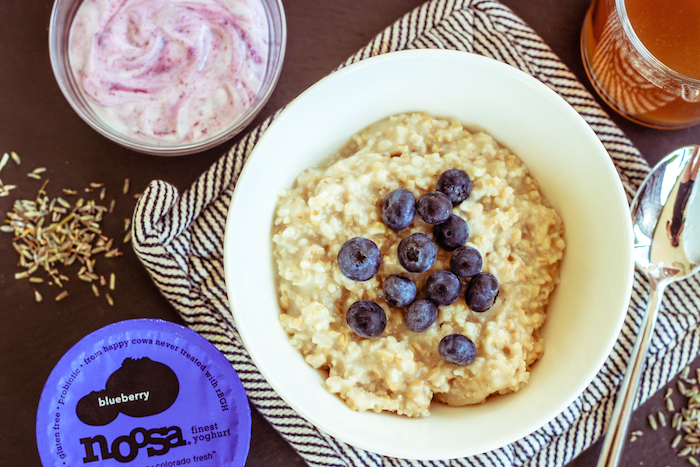 When noosa® asked us to sample their yoghurt, I was excited to share how we have been making yoghurt a daily part of our diet at my house. 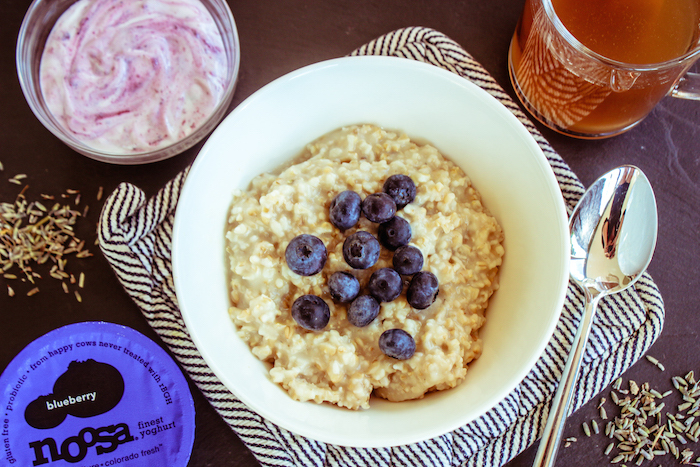 I love noosa® yoghurt for its velvety texture and the flavor that comes from the touch of clover alfafa honey, and of course the fact that it is farm fresh, made in Colorado from locally-sourced, family-farmed milk. Continue reading to get my recipes for Lavender Infused Oatmeal, Mixed Berry Scones, and the Papaya Yogurt boats pictured here. Serve in a bowl with fresh blueberries and a side of yoghurt. 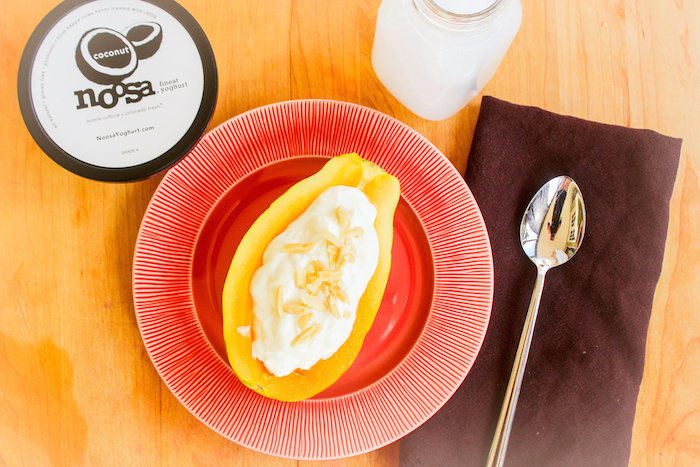 This is the simplest way to prepare breakfast: Just slice a ripe papaya in half (a ripe papaya is about half green and half yellow), then remove the seeds and use it as a bowl for the bright flavor of noosa® coconut yoghurt. If you like a little crunchy texture, add some slivered almonds. Or just eat everything by itself, it’s delicious that way, but cuter this way. I pair this combo with refreshing coconut water for a tropical morning treat. These mixed berry (blackberry, raspberry, and blueberry) scones are the simplest thing in the world to whip up, and they turn out so moist and delicious (not dry like scones we often get in stores or chain shops). 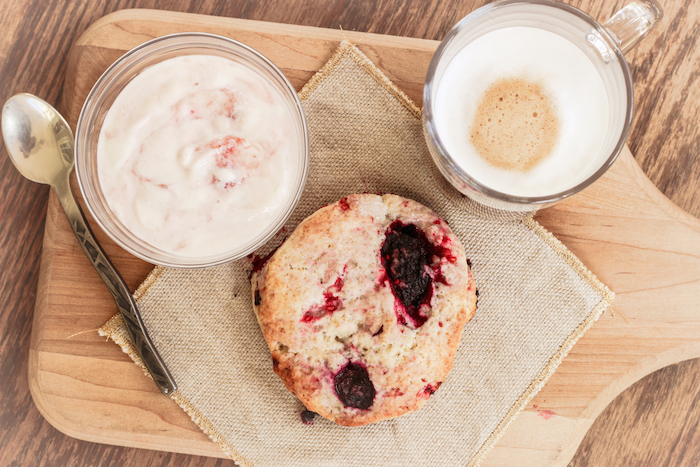 Just follow our Kevin’s Famous Scones Recipe and use a half cup of frozen mixed berries for the fruit. 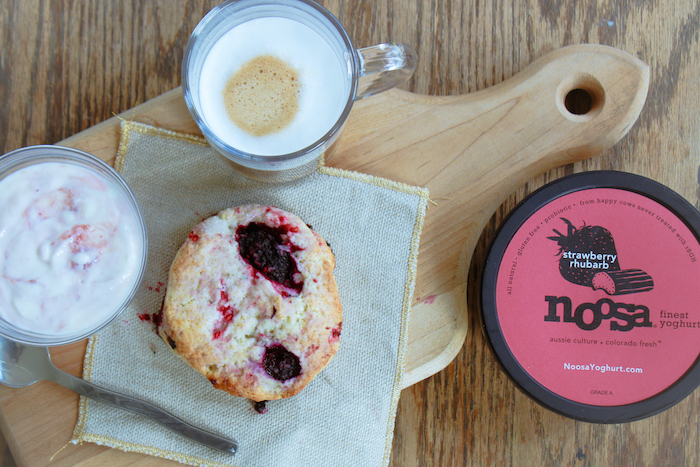 The blackberry/raspberry flavor is the ideal tart accompaniment to the smooth, rich flavor of noosa® strawberry rhubarb yoghurt. This and a latte is the perfect cozy morning rainy-day breakfast. Try noosa® today! Get a coupon here. To find noosa® in your area, use their handy locator. 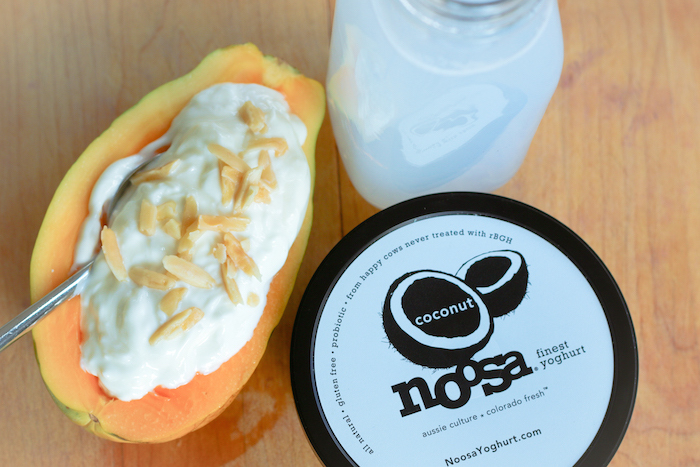 This blog post is sponsored by noosa® yoghurt and SocialMoms. As always, the opinions and ideas expressed here are my own, and they are also really yummy.